The figure of Kubo Kohei (久保幸平) is already known to the readers. 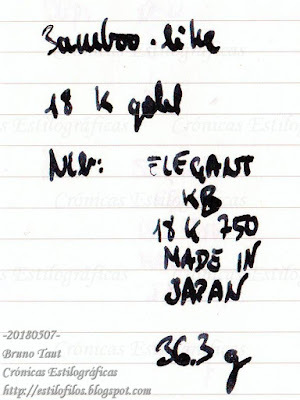 He is a very prestigious nibmeister with a long history of nibs made for his own brands –Elliott, Nobel–, and for others –Push, Danitrio, even Zôhiko. The purpose of this Chronicle is to show some more remarkable creations of this master. 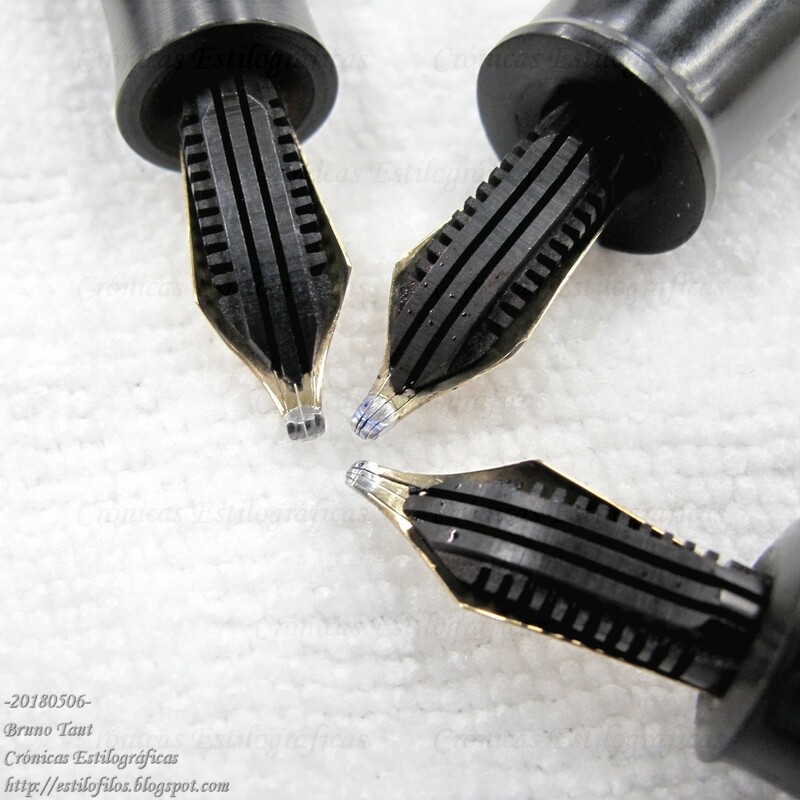 An unusual music nib by Kubo Kohei. Kubo Kohei has made music nibs in the past, as I have reported here. 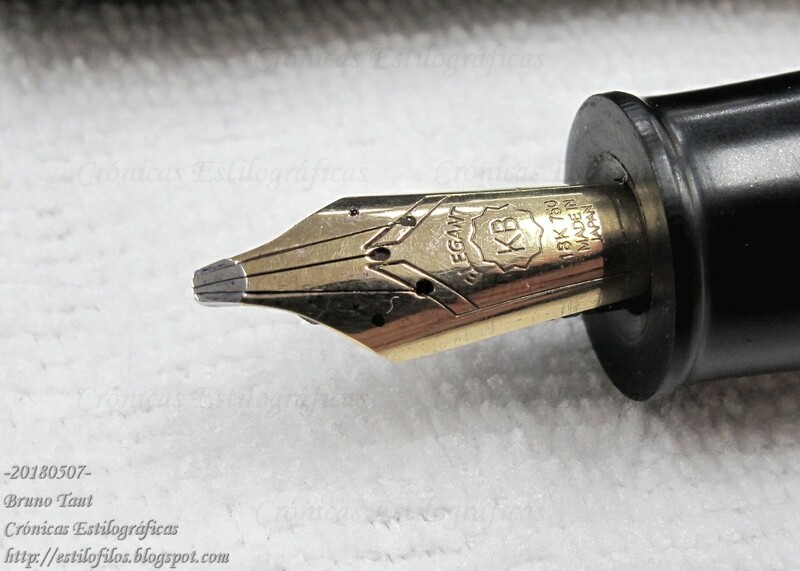 However, that example was a very traditional music nib: two slits, three tines. The following examples go one step forward: three slits, four tines. The result is a very broad and wet line showing a good –but not extreme— variation on the writing. Writing sample of a 4-tine music nib by nibmeister Kubo. 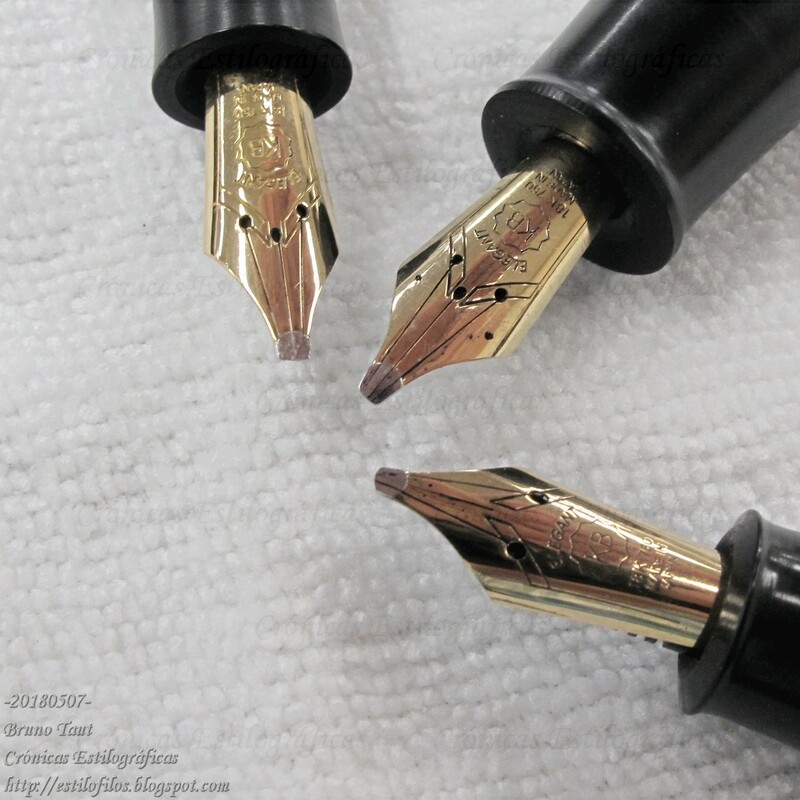 These three music nibs are associated to three outstanding pens—three old pens made by Sakai Eisuke (酒井栄助). They had not reached the market and had been retrofitted with Henckel nibs, which is not rare in what looks like production leftovers by the Ban-ei group. 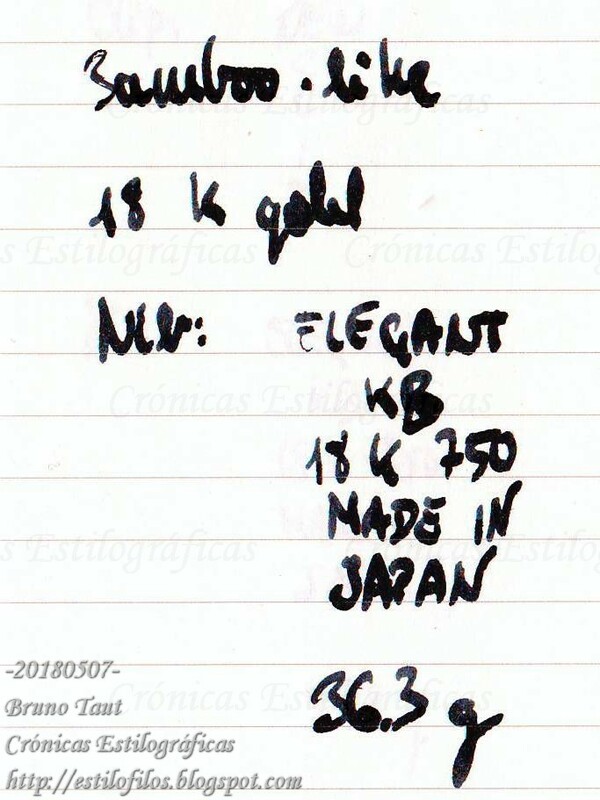 All three nibs carry the same inscription: "ELEGANT / KB / 18 K - 750 / MADE IN / JAPAN". However, the ways their tips are cut are different--the one on top is very sharp, and that on bottom is the roundest of them. The three pens where Kubo met Sakai--years after the disappearance of the later. 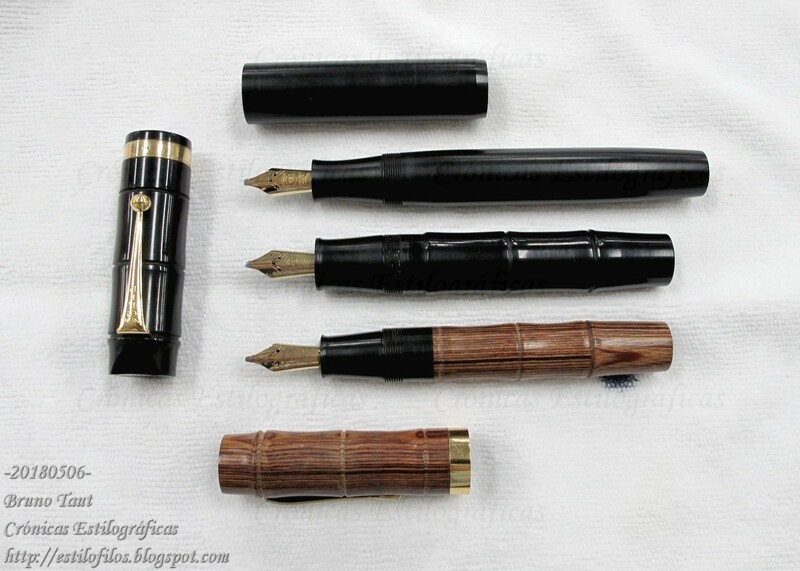 Only the pen in the middle (black ebonite in the shape of bamboo) has an additional engraving--on the clip it says "NEW CLIP", showing some parts coming from Fukunaka Seisakusho. The plain black pen (on top) has no clip. Remarkable pens with remarkable nibs, although they might not be the best match. But sure they are attractive and desirable. My thanks to Ms. Lai. Amazing nibs. Thanks for sharing them with us. Thank you both, Saltire and Leonardo. I am relieved and pleased to know that these exotic nibs are of interest to someone else besides myself. These nibs are not what you can grasp any day, wow. Thank you for sharing! Thanks, Lev, for passing by and commenting. And you are certainly right. That was my reaction when I saw them.